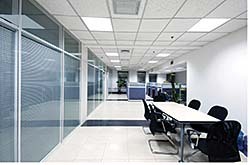 These Edge-Lit LED panels are ceiling-mounted fixtures that uniformly illuminate workspaces without the glare of LEDs. The panels feature an opalescent lens that produces little glare. The fixtures are 120-277 volts with a range of wattages, lumens and Kelvin temperatures available. Models are available in 2-by-2 feet and 2-by-4 feet and can be installed in most grid ceilings. Fixtures include accessories for surface mounting, recessed mounting into hard ceilings, or pendant mounting; 1/2-inch thick panels; and surface-mounted panels with a 2-inch deep black box and overall depth of less than three inches.